Most people don't know how to nurse their emotional wounds. Wounds that don't heal can contaminate every aspect of your life. Open wounds affect how you view the world, how you relate to others and how you conduct your life in general. Because the FIRST AID KIT FOR EMOTIONS has been nonexistent most people don't know how to nurse their emotional wounds. Untreated emotional wounds can cause physical, mental, emotional, and spiritual problems. They can set off mental health disorders such as depression, anxiety, and addictions. They can wipe out relationships, add to job failures, obscure life's purpose or direction, and ultimately destroy life. This workbook is full of stories of transformation. People who felt stuck, alone, in despair - finding the courage to face their emotional wounds, taking the risk to open up to their feelings, changing in ways they never imagined possible. THE SAME CAN HAPPEN FOR YOU. 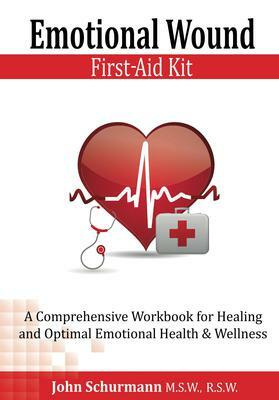 For anyone who wants to restore and enhance their emotional, intellectual and spiritual health, this workbook will be an invaluable resource. Furthermore, the guide will provide the central self-care skills to help you develop a healthy, vibrant and resilient mind, heart and spirit. Moreover, it can be used to develop your own self-help program or as an adjunct to therapy. Thanks for your contribution John. All the best! Join in and write your own page! It's easy to do. How? Simply click here to return to Self Help Skills Helpful Tips.